This post is sponsored by Mezzetta. All thoughts and opinions are my own. Have you ever forgotten until last minute that you offered to bring something to a friends house? Yikes… me too! 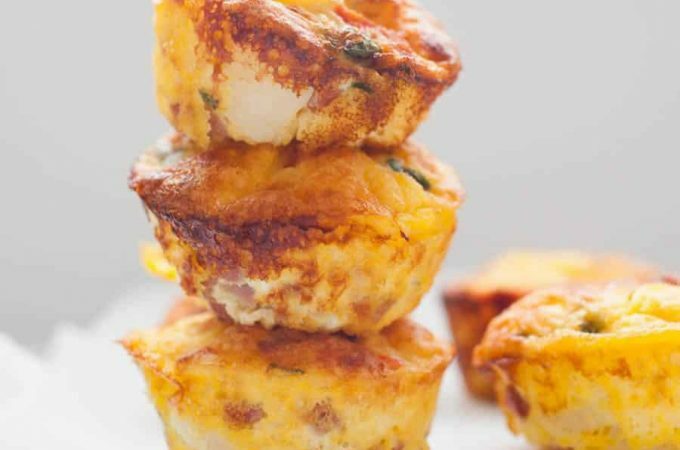 That’s where this easy appetizer recipe comes in. It can be thrown together quickly and every time I’ve shared it with people they go crazy over it. In fact you might think that someone licked the dish clean because it’s usually completely cleaned out. 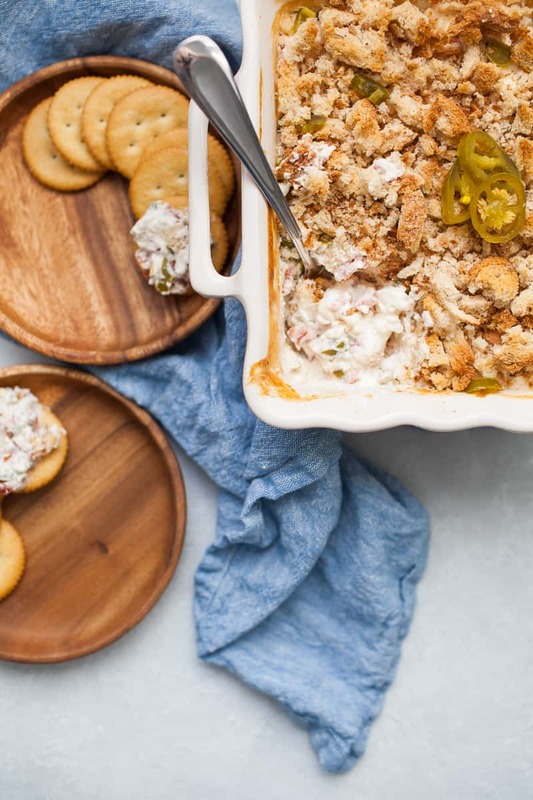 This cream cheese jalapeño dip is the best appetizer to share with friends whether it’s around the couch watching football or as a starter to a dinner party. It’s spicy, creamy and packed with flavor. Of course this easy party dip wouldn’t be what it is without the jalapeños. 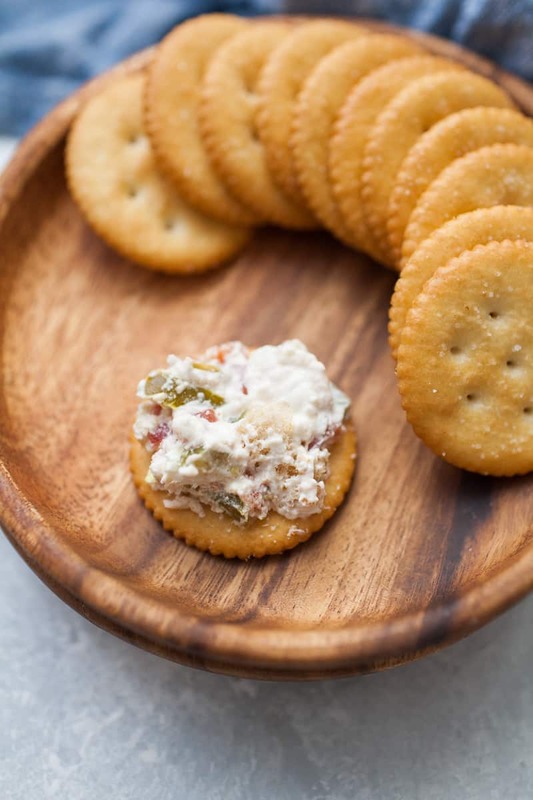 I’ve used fresh jalapeños before for this recipe, but I really love the convenience of using jarred jalapeños from Mezzetta. I almost always have all of the ingredients for this recipe already, except fresh jalapeños. So I’ve tweaked this recipe to use Mezzetta Deli-Sliced Tamed Jalapeño Peppers so that I can always whip this recipe together! Ever since I was pregnant with my oldest son, I haven’t been able to tolerate the heat of fresh jalapeños. 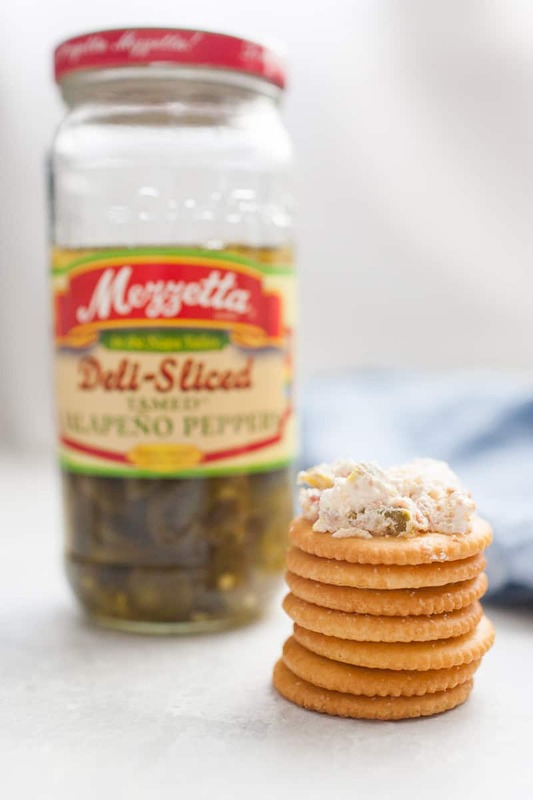 The tamed jalapeño peppers from Mezzetta are a perfect blend of jalapeños and bell peppers that are flavorful without knocking you off your seat with spiciness. But they also have other varieties of jalapeños if spice is your thing! What ingredients do you need for jalapeño dip? 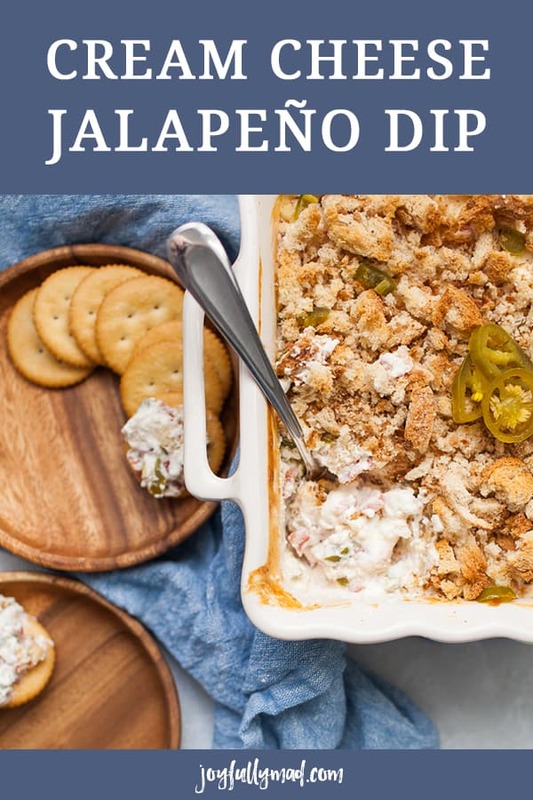 How do you make jalapeño popper dip? Chop jalapeños and add to a medium sized mixing bowl. Add in sour cream, cream cheese, and tomatoes with green chiles. Mix together ingredients. If your cream cheese wasn’t soft enough to really mix together, you can bake it for 10 minutes and stir before adding bread crumbs on top. To make your own homemade bread crumbs, simply toast 2 slices of bread to just golden. Place in a food processor and chop until pieces are 1/2 inch or so. You can also chop into 1/2 pieces with a knife. Pour bread crumbs over dip mixture, top with a few extra jalapeño slices and bake for 25 minutes, until bread crumbs are golden brown and dip is hot. Serve with crackers or slices of bread for dipping. 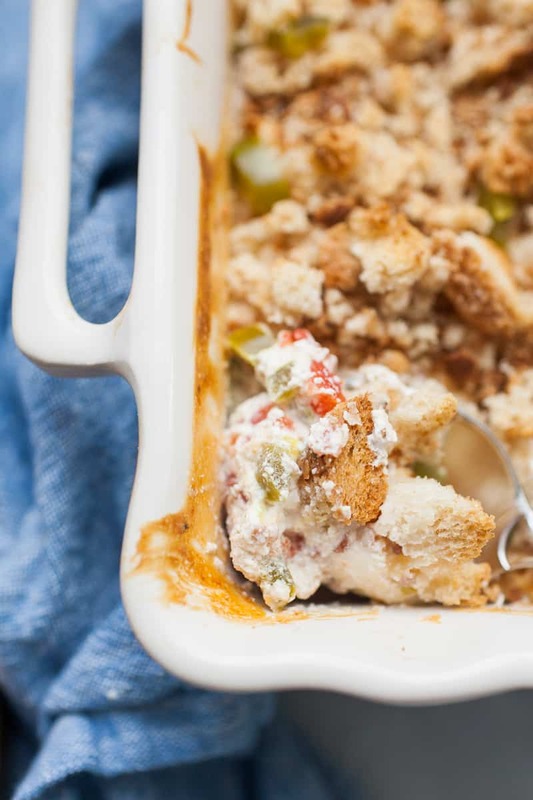 Do you have to use homemade bread crumbs for this recipe? No, you definitely don’t! 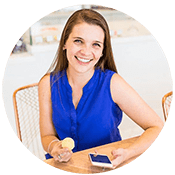 Personally, I love to because I love the texture of big chunks of bread crumbs on top! If you don’t want to make them homemade, I’d suggest checking your deli section at your grocery store for the package they sometimes sell with fresh/stale bread cubes. That will work perfectly. Regular finely ground bread crumbs will work, but I recommend mixing in a tablespoon of melted butter, so they aren’t just dry and sitting on top of the dip. How do you make this dip spicier? 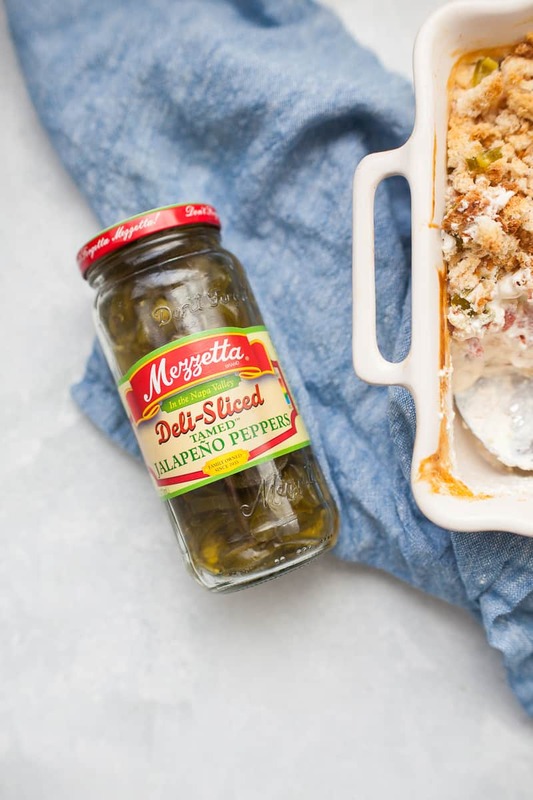 If you want this jalapeño popper dip to have more of a kick, consider getting the Hot Jalapeños from Mezzetta or adding in some of their jarred green chiles! You could also use fresh jalapeños if they are available to you. How can you make this ahead of time? Mix all of the ingredients ahead of time and place in fridge until party time. You can also completely bake this early and then reheat in the oven or under a low broil for 5-10 minutes to reheat. 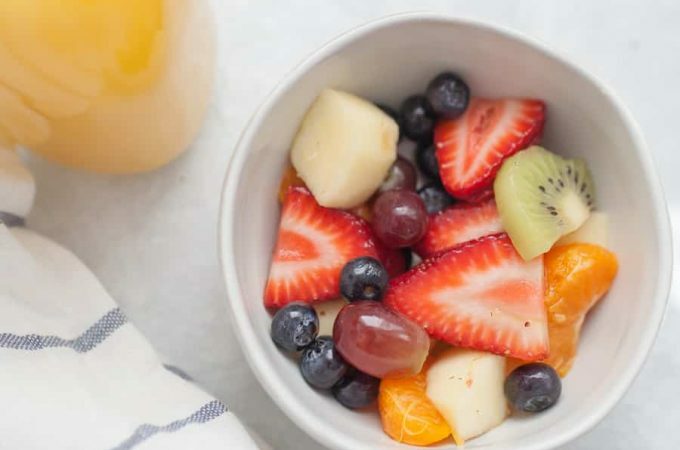 Are you ready to step up your snack game? 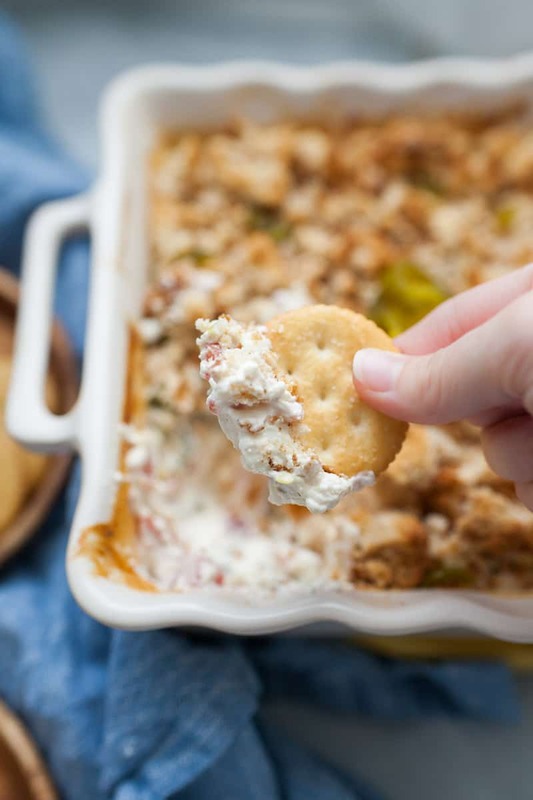 This creamy jalapeño dip is the best appetizer for a party, football gathering or just because! It’s become a staple in our house! 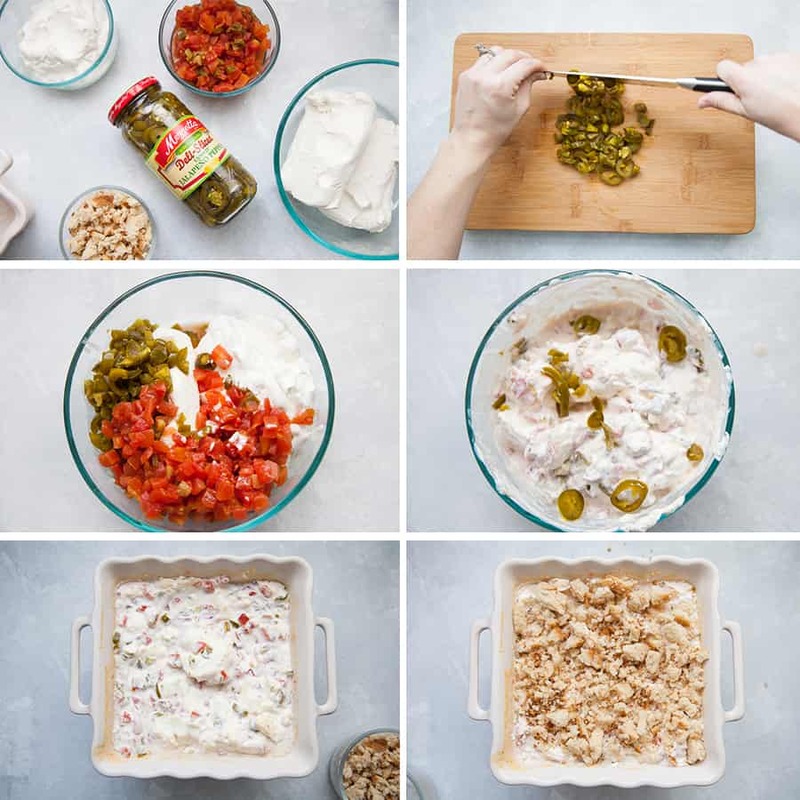 This Cream Cheese Jalapeño Dip will become your go to party appetizer! 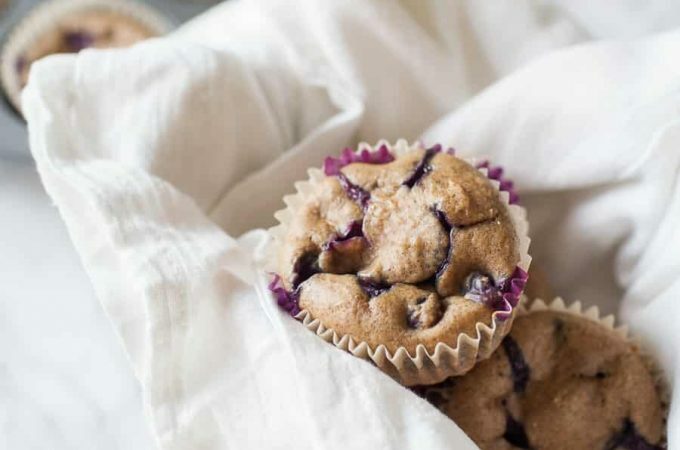 It's a classic, easy recipe that can be thrown together for any occasion. 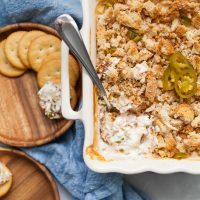 This dip is made with cream cheese, sour cream, jalapeño peppers, tomatoes and green chiles and topped with bread crumbs, all baked and served with crackers for dipping. Pour bread crumbs over dip mixture, top with a few extra jalapeño slices and bake for 25 minutes at 350º, until bread crumbs are golden brown and dip is hot. Serve with crackers or sliced bread for dipping. 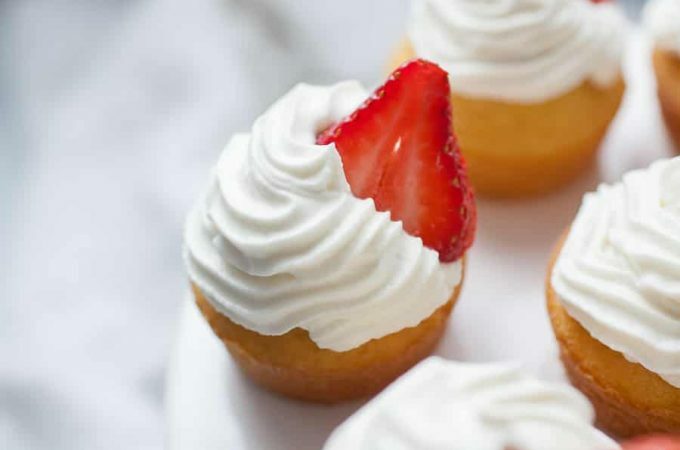 If your cream cheese isn't soft enough to mix together easily, you can stir ingredients the best you can, bake it for 10 minutes and stir again before adding bread crumbs on top. Then continue baking for 15 minutes.